"A friend of mine got this recipe while traveling in Italy. Chicken, mushrooms, and tortellini in rich cream sauce. Delicious! Serve sprinkled with parsley and cheese." Bring a large pot of lightly salted water to a boil. Add tortellini. Cook, stirring occasionally, until tortellini float to the top and the filling is hot, about 5 minutes. Drain. Heat vegetable oil in a large skillet over medium heat; cook and stir chicken breast in hot oil until no longer pink in the center, about 10 minutes. Remove from heat. Melt butter in another skillet over medium heat; cook and stir mushrooms and garlic powder until mushrooms begin to soften, about 3 minutes. Stir heavy cream into mushrooms and bring to a boil. Reduce heat to medium-low and simmer until slightly thickened, about 3 minutes. Add Parmesan cheese, parsley, and salt. Continue to cook until cheese is melted, about 1 minute. 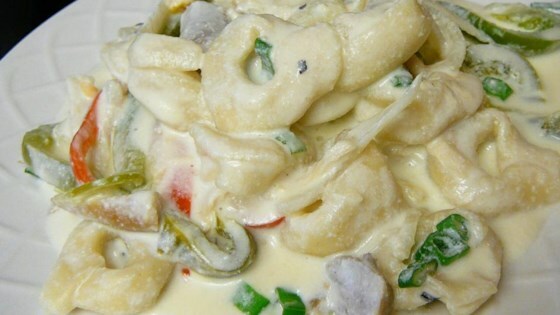 Stir tortellini and chicken into mushroom-cream sauce. Simmer until heated through, about 2 minutes. Very easy recipe. I baked the chicken, and shredded it rather than pan cook. Much more tender chicken. I substituted Shiitake mushrooms as well. Even my children liked it! It was great. Put my own spin on it. I added green peppers and spinach along with the mushrooms. This turned out great and it was very easy to make. I just used regular fettuccine pasta instead of the cheese tortellini and I also used dried parsley flakes instead of fresh.